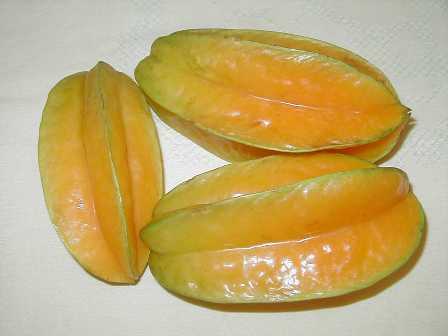 Carambola or star fruit (Averrhoa carambola) is native to Indonesia. The acidic nature of the pulp is due to its oxalic acid content. It is a small tree with drooping branches and bears attractive, golden-yellow, 3-5 ribbed, oval elliptic fruits measuring 12-15 cm in length. Fruits of carambola contain a juicy pulp which may be acidic or sweet depending on type. The fruit is a good source of vitamin A, B and C together with valuable minerals and iron but not calcium. 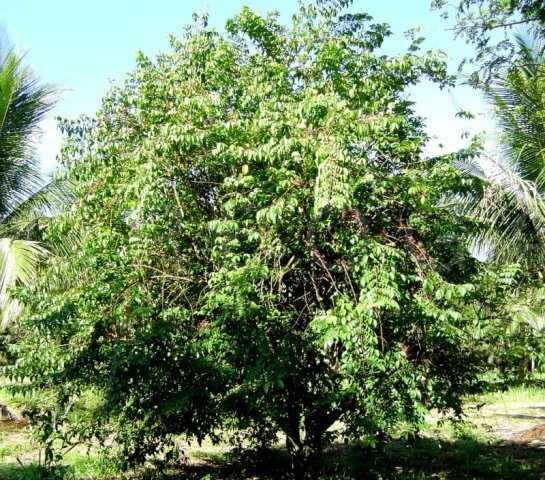 Various plant parts of this fruit tree are credited with medicinal properties, e.g. 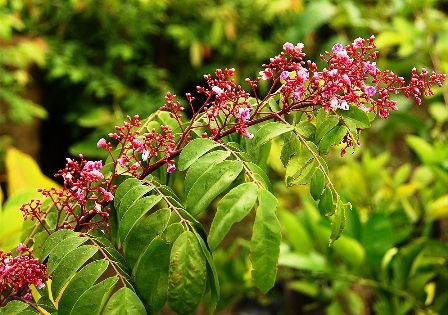 root extract is used as an antidote for poisoning and crushed leaves for curing chicken pox, ring worm and scabies. The pulp of immature fruits is used for cleaning brassware. Carambola prefers warm moist climate and can be grown in India on the hills up to 1,200m. A well distributed rainfall encourages normal growth and cropping. It can grow on any type of soil with good drainage, but deep rich soil supports better plant growth. Although it grows both in acid and alkaline soils, yet it prefers acid soil. Trees growing on calcareous soils sometimes require zinc sprays. Specific varieties are not known in carambola, but two main types are distinguished viz. sour and sweet. The sour types contain as much as1% acid and the sweet types have low acid (0.4%) with 5% sugars. Some Chinese types like Fuang Tung are very sweet and Brazilian ones are rich in vitamin C. Some superior types of carambola are available at Columbia (Icambola), Taiwan (Tean Ma, Min Tao) and Hawaii (Golden Star). Carambola is often propagated through seeds, but budding, grafting and layering are recommended to produce true to type plants. The seeds have low viability and hence should be sown fresh. After cleaning and drying the seeds, they should be sown in plastic bags and allowed to harden. They are then transplanted to the field. When seedlings are to serve as rootstock, they should be at least one year old, on which budding (shield) or grafting (veneer or approach) can be taken up. The planting of carambola trees on orchard scale is seldom done. Planting can be taken up by providing 8m x 8m spacing when one plans to raise a regular orchard. 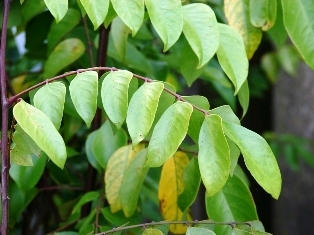 Practically no specific training or pruning operation is advocated for carambola trees. There are no recommended nutrient dosages. However, it is a good practice to manure the trees once in a year (40-50kg of farmyard manure/tree) and also apply some nitrogenous and phosphatic fertilizers, the doses depending upon the age and size of the tree and the fertility of the soil. For better orchard establishment, operations like watering of young plants as and when required, shaking, basin cleaning and protection from cold are important and should be carried out as per need. Irrigation is provided when there is a long dry spell. This helps to secure a good crop. Seedlings take about 4 years to come to bearing but grafts produce crop in 1-2 years. Carambola produces flowers and fruits even on the trunk. The fruits are borne year round under Indian conditions, but peak yields are obtained during January–February and September-October. Yield varies according to the age, variety and plant health. About 80 kg fruits can be harvested from a grown up tree. Fruits of sweet type are eaten fresh and sour ones can be used for making refreshing drinks, pickling or a substitute for tamarind. Good quality squash, jelly, preserves and candy can also be prepared from carambola fruits. 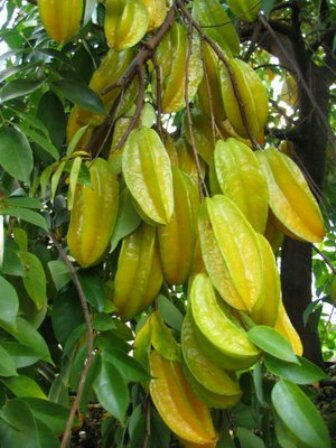 With proper packing, fruits of carambola ship well, but the fruits are mostly supplied to local or nearby markets.